Memberikan cakupan global yang komprehensif tentang dunia sekitar, dalam bentuk lebih dari 40.000 artikel terkini yang ditulis oleh pakar internasional, termasuk para penerima nobel. Britannica Global Edition Today�s Knowledge in a Compact Format, The editors of Encylopedia Britannica, the world standard in reference since 1768, present the Britannica Global Edition. 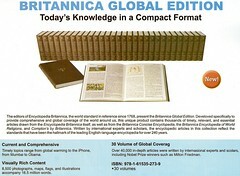 Develoved specifically to provide comprehensive and global coverage of the world around us, this unique product contains thousands of timely, relevant, and essential articles drawn from the Encyclopedia Britannica itself, as well as from the Britannica Concise Encyclopedia, the Briannica Encylopedia of World Religions, and Comton�s by Britannica. Written by international experts and scholars, the encyclopedic articles in thes collection reflect the standards that�s have been the hallmark of the leading English-language encyclopedia for over 240 years. 8.500 photographs, maps, flags, and illustrations accompany 16.5 million words. Over 40.000 in depth articles were written by internasional experts and scolars, including Nobel Prize winners such as Milton Friedman.